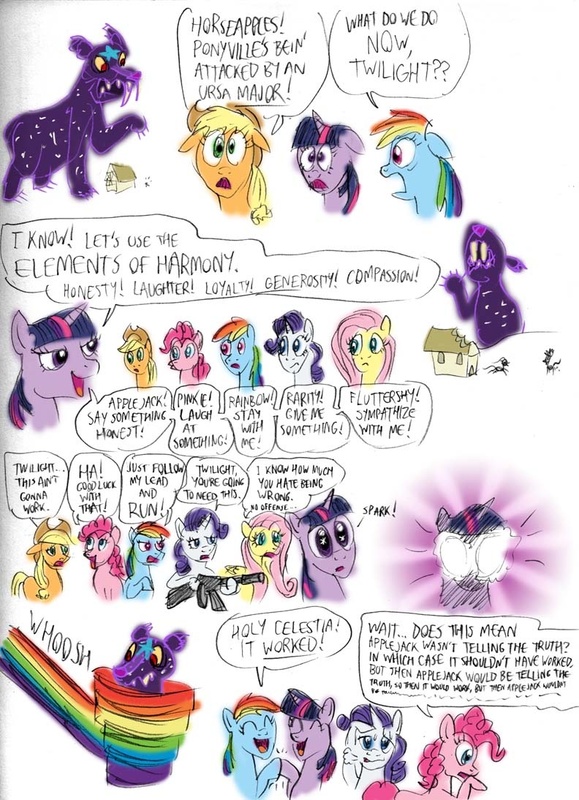 The first MLP comic I drew with all the characters in it. I think I got one thing wrong: I drew Pinkie Pie using sarcasm, but based on later observation of the show, I don't think she actually understands sarcasm. Suddenly, the Ursa Minor's mommy shows up and starts wreaking havoc and destruction! What will our pony heroes do? I'unno. Sump'm, I hope. Drawn and colored quickly for the hay of it one day. same reason lie detectors arent fool proof. they detect intentional deciet, not whether something is true or not. one: polygraphs work correctly for what they are intended, which is detecting intentional deceit. In my fan-fics, the Veridicator Spell is a very old one. You cast this spell at the target, and then ask him or her a "yes or no" question. If target answers truthfully, your wand will glow green. Target lies knowingly & willfully, wand will glow red. Target is not sure whether answer is true or false, the wand will glow yellow. Just a coincidence. It's a reference to an episode of My Little Pony: Friendship is Magic, in which the Ursa Major was a monster that looked like a giant bear made of stars. you're wrong pinkie, it didn't work as she had planed, but it did work in a way that triggered what she had planed, that's why it worked. Poor Pinkie is gonna be stuck in logic mode... Quick! Someone yell "Party!" She stitched it together herself! I JUST NOW noticed the stick figure pony literally getting the crap scared out of it in the second row! I just happened to be looking back at some of my favorites tonight.